Jeffrey Lurie will speak to the media this week. PHOENIX -- The NFL meetings that run through Wednesday at the Arizona Biltmore hotel are where the league will decide rules changes for the upcoming season, but the meetings also provide the most extensive access to the Eagles’ brain trust we’ll get all year. Team owner Jeffrey Lurie, executive vice president for football operations Howie Roseman, and head coach Doug Pederson all are scheduled to speak to reporters before the sessions conclude. The team’s approach to free agency certainly will be a relevant topic, with the Birds bringing back wide receiver DeSean Jackson and defensive end Vinny Curry from Tampa, re-signing their own in defensive end Brandon Graham and cornerback Ronald Darby, and generally adding a group of players that A) trends toward the over-30 and B) so far does not include a running back. The Eagles also traded to New England Michael Bennett, their most effective pass rusher last season. It is not unheard of for a trade or signing to occur during the meetings. The Eagles signed defensive end Chris Long during the meetings in 2017. This year, running backs Duke Johnson of Cleveland and Jordan Howard of Chicago have featured in Eagles trade speculation. 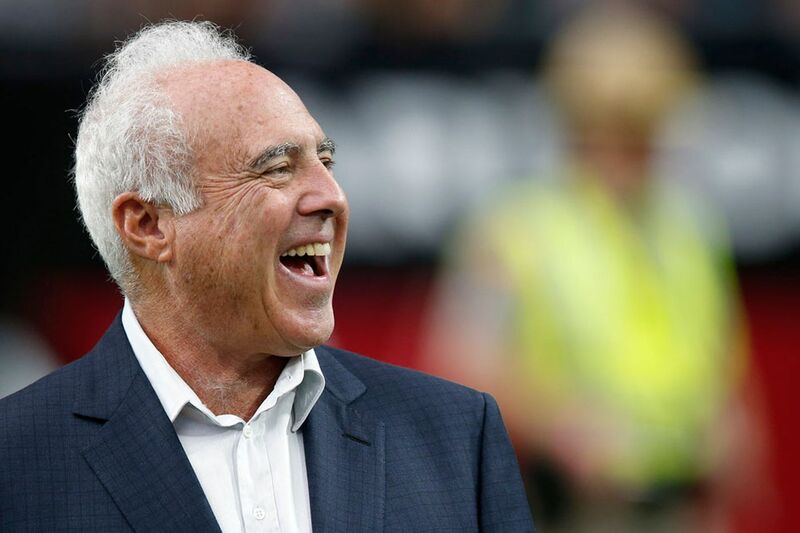 Lurie hasn’t spoken to reporters since the season ended. We don’t know his thoughts on how 2018 went, on scrutiny of the medical staff after the Eagles suffered such an extraordinary number of soft tissue injuries, or the departure of Super Bowl MVP Nick Foles in free agency for Jacksonville. Roseman has opened up much more salary cap room this offseason ($25.9 million, according to Spotrac. com) than he apparently plans to use in free agency, with most of the big-ticket players having signed. Is Roseman planning on negotiating a long-term extension with quarterback Carson Wentz this year? As recently as the NFL Scouting Combine, less than a month ago, that did not seem to be the plan, given that Wentz has ended the past two seasons on the sideline because of injury. Both the Eagles and the Wentz camp seemed content to wait to see how 2019 went, before sketching out the parameters of a new deal. This will be Wentz’s fourth season; he has a fifth-year option for 2020 the team can pick up if needed. Pederson hasn’t talked about any of the personnel issues, since the combine and the start of free agency. Presumably, he would like to add a running back, since that is the spot on the roster where the Eagles are most lacking in experience and good health. And speaking of good health, the NFL Network reported Sunday that Pederson recently underwent foot surgery to correct a nagging problem. He was spotted in the lobby of the Biltmore riding one of those one-leg scooters. Of course, the Eagles will have their say in rule-change discussions – in fact, they brought to the competition committee a proposal to make Dallas and Detroit alternate home and away games each Thanksgiving, instead of both teams being guaranteed a home Thursday game each year, as has been customary. That proposal was withdrawn, committee chairman Rich McKay told reporters in a Friday conference call. McKay added that this is not the first time the Thanksgiving situation has been brought up. The big rules issue this offseason is how to address what happened at the end of the NFC Championship Game – the Rams holding on to beat the Saints, going to the Super Bowl after an obvious final-drive pass interference penalty call against them wasn’t made. Had the play been officiated correctly, the Saints would have been able to run down the clock and try a short game-winning field goal. NFL executive vice president of football operations Troy Vincent spoke on the conference call of “a real reluctance of putting a foul on the field” among the committee members. McKay contended there was “no support” on the committee for the “eye in the sky” press box official who probably would need to be added to make such a thing possible. As McKay noted, changes involving the review process are hard to build consensus around. Oakland coach Jon Gruden has said he would like to do away with replay review entirely, just live with the result on the field. Other figures, such as New England coach Bill Belichick, have advocated making everything reviewable. The quest to get everything exactly right runs counter to another goal the league considers important – reducing the length of games. McKay said the average game was four minutes shorter in 2018 than in 2014. It is possible the league will add an eighth on-field official, presumably with the idea that this would make situations like the ending of the Rams-Saints game less likely. “We’ll be interested to see where the membership is” on such changes, McKay said.